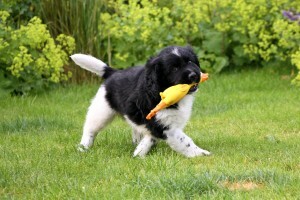 With just 34 in the UK and 6,000 worldwide, Emo is one of the world’s rarest dogs and the first Stabyhoun in Scotland. Born in May in Manchester, he and his six brothers and sisters are part of a project to introduce the breed to the UK. Generally considered amongst one of the world’s rarest dog breeds, the Stabyhoun originates from the Netherlands. About the size of a small Labrador, it was bred as an all-round family and farm dog – required to work alongside the farmer during the day and to live inside the family home alongside children and other pets. The name Stabyhoun is most likely from the Dutch: “sta me bij” which means ‘Stand by me’ – an accurate reflection of its loyal nature. Christina Savage is the President of the UK Stabyhoun Association and founder of the project which began back in 2012. Originally from Denmark where she grew up with a Stabyhoun herself, she now lives in Manchester with Emo’s mother, Jelske. Cathy Hawes and her five-year old son, Ben live in a small Perth and Kinross village with their two cats, five hens and three ducks. Cathy was looking for a breed that would naturally get along well with their cherished pets and be a playful yet gentle companion for her young son. “I spent months researching dog breeds; comparing personality traits, exercise requirements, size, temperament, and so on. And just when I had convinced myself that there was no such thing as the perfect breed for us, I came across a description of the Stabyhoun. It ticked all the boxes so naturally we got very excited. Cathy had to wait five weeks before finding out which puppy would be joining their family. “These puppies are allocated to each family based on their temperament and, to a lesser degree, their potential for working and breeding. Ben fell in love with Emo when we came to visit a few weeks earlier, but I had complete confidence in Christina’s final decision for us. Secretly we hoped Emo would be the one and we were so excited when Christina approved,” says Cathy. She added: “I wanted a dog that could be part of the family and likes to play, but also one that would be content crashing out for an hour or two after a walk. And that’s exactly who joined our family on 5 July when Ben and I collected Emo from Manchester. Janice Vittachi, the association’s Vice President, is planning the country’s next litter of Stabyhoun puppies which could be on the cards this autumn. The role of the UK Stabyhoun Association is to manage the introduction of the Stabyhoun to the UK as well as implement a controlled and closely monitored breeding programme to protect the health and temperament of the breed.